Do you know the story of ganga nadi or how ganga came on earth? Mother Ganga the personified form of the sacred River Ganga, is known to be melodious, scintillating and forgiving, who washes away our sins and liberates us from the circle of life and death and her coming to earth makes a beautiful story. Kapila opened his eyes after many years due to the accusation and the fire of anger from his eyes burnt the sons into ashes. (It is also said that Kapila was the son of the Agni Deva or Fire God.) When King Sagar realized that his sons have not returned, he sent for a search and realized the fact of his sons’ tragic demise and the curse that will follow through their generation and kingdom. After many years Anshuman, son of an outcast son of King Sagara i.e. Sagara’s grandson discovered the remnants of his ancestors near the still meditating sage, asking for forgiveness and release from the curse pleaded to Kapila to suggest a way to liberate his ancestor’s trapped souls. He suggested that it can only be done by sprinkling ‘Gangajal’ or the Holy water of the Ganges over the ashes and hence help them achieve moksha or salvation. But for that to happen one has to go through strict penance and request Lord Brahma to let Ganga out of his kamandalu ( a water-pot used by saints) to let her flow to earth. Anshuman begins with the penance but failed to invoke Lord Brahma, then his son Dilip goes further with it to meet the same fate. In order to bring peace in the kingdom the kings could not help but perform the penance, then Dilip’s son Bhagirath begins with the penance leaving his kingdom to his confidante ministers. As the name suggests, King Bhagirath was the epitome of hard work and wisdom, he undertakes even tougher ways to perform it and after thousands of years of strict penance, he finally succeeds in invoking Lord Brahma and asks him to release the Ganges to come down to earth in order to cleanse his ancestors’ cursed soul. At this, Lord Brahma suggests that the Ganges cannot be brought to earth directly from heaven as her truculent flow will bring havoc to earth. 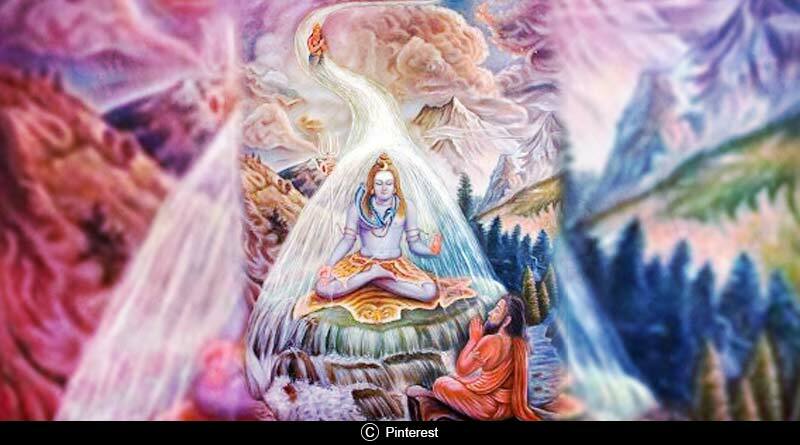 Brahma suggests Bhagirath invoke Lord Shiva to help him further. It is also said that while the Lord Vishnu took his Vamana Avatar, he had created a hole in the Universe with his toenail while he took one of his steps from netherworld to the heaven. With this hole, the Ganges came down to earth and then to netherworlds. The River Ganges is also said to be the doorway to heaven from both the worlds. In the Sanskrit Language, it is called Tripathaga, which means ‘the one who travels all the three worlds’. After successfully invoking Lord Shiva, Bhagirath asks for his help in bringing the Ganges down to earth without any mass destruction. The Goddess Ganges was playful as the nature of water before she came down to earth. When the Ganges is released from Brahma’s Kumandalu to fall on earth, Shiva spreads his serpentine locks of hair over the entire earth to protect it and confines her fierce flow in his serpentine coils. After her rigorous efforts and Bhagirath’s plead to fulfill the cause, Shiva lets her flow out in different streams to spread her on the entire earth. That is how the Ganges received its many names and Shiva came to be known as Gangadhara. The Ganges then follows behind Bhagirath and on her way enters Sage Jahnu’s hermitage and wets him, disturbing his deep meditation, he out of rage, drinks all her water and stores it in his body. Bhagirath on discovering the series of events that took place in the hermitage, explaining the cause of Ganges’ arrival on earth to Jahnu asks him to release her, Jahnu then releases her through his ear and hence the Ganges received her name ‘Jahnavi’. Vighnaharta ganesh – Why lord Ganesha worshipped first before any deity? The Ganges then filled the abyss that the 60,000 sons had created and reached their ashes, releasing their souls to heaven. The abyss came to be known as Sagar after the king Sagara’s name. The Ganges after Shiva’s divine touch gained the motherly instincts to preserve and nurture the creatures on earth and also help them cleanse their soul. This is how she came down to earth to help Bhagirath to perform the last rites of his ancestors and free their souls from the curse. Therefore The Ganges is also called as Bhagirathi. We hope the story of ganga nadi has been able to clear your doubts and questions as to who brought ganga to earth. Do share your feedback. What is the importance of Raksha Bandhan?